Just after dawn, an alligator (in the foreground) watches as a tugboat pushes the Pegasus barge carrying External Tank 119 away from Kennedy Space Center for transfer to NASA’s Michoud Assembly Facility near New Orleans on Sept. 27, 2005. CAPE CANAVERAL - NASA has aplan to fix its problem-plagued external fuel tanks, and the agency is studyingthe possibility of launching its next two shuttle missions in May and July. NASA aims to replace anexternal tank foam ramp that shed a one-pound piece of insulation on theagency's first post-Columbia mission, prompting managers to put future flightson hold. NASA shuttle chief WayneHale met with managers Thursday and asked them to determine what it would taketo launch a second test flight in May and an International Space Stationassembly mission in July. Hale "was verystraight-forward in saying, 'Look, these are not launch dates, but I just wantyou guys to come back and tell me what it would take to get there, if we canget there,' " said Kyle Herring, a spokesman for NASA's Johnson SpaceCenter in Houston. NASA's next missionofficially is targeted for a March launch. But foam insulation problems andhurricane damage to agency facilities have made that all but impossible. "I think that Maywould be the earliest, based on two hurricanes that not only caused damage atsome of the facilities but also displaced the work force," Herring said. Hurricane Katrina damagedNASA's Stennis Space Center in Bay St. Louis, Miss., and Michoud AssemblyFacility in New Orleans. The agency estimates its repair and recovery costswill be about $1.1 billion. Shuttle engines are testedat Stennis. Tanks are made at the Louisiana factory. Hurricane Rita forced NASAto close JSC last week, but no serious damage was done. Katrina destroyed ordamaged the homes of many of the 3,500 NASA and contractor employees who workat Stennis and Michoud. Many still are living in temporary housing. "The work force is thefirst and foremost priority -- making sure that they are safe, and that theyare taken care of. At the same time, a lot of those people who are affected arealso motivated to get back to the business of flying space flights,"Herring said. "Even with thedevastation to their lives, it's been kind of remarkable that they have steppedup and are back at work and are trying to balance that with their own personalissues." piece of insulation during Discovery's July 26 launch. In a haunting reminder ofthe Columbia accident, the foam nearly hit the shuttle's right wing. A 1.67-pound chunk of foamfrom Columbia's tank punched a hole in that shuttle's left wing, enabling hotgasses to rip the ship apart during atmospheric reentry. The foam that doomedColumbia was designed to keep ice from building up on and potentially breakingoff of an area where metal struts connect the tank to the nose of the orbiter. A heater replaced theso-called bipod ramp as part of a $205 million post-Columbia effort to fix thetank. On Discovery's flight, foambroke off a protuberance air load ramp that runs along the side of the 15-storytank. Its purpose: To ensure smooth airflow and minimize vibration aroundnearby pipes and cables. NASA plans to remove the37-foot ramp, replacing it with a new type of foam that will be applied withmore exacting techniques designed to prevent shedding. The area will be outfitted withinstrumentation to better understand aerodynamic forces that could cause damagein flight. Engineers think the changewill work because the first 10 feet of the ramp was removed and replaced inthat same fashion prior to Discovery's flight. The work was done so that asafety modification could be made beneath the ramp, and no foam was shed fromthe reworked area. 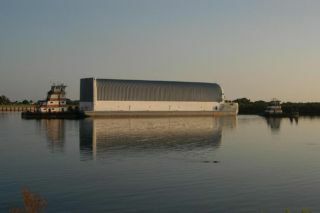 The tank for NASA's nextshuttle mission is being brought by barge back to the New Orleans factory andis expected to arrive there Sunday. Engineers plan to usehigh-tech inspection gear to examine the ramp. Then they'll remove it anddissect it to try to learn more about the foam shedding phenomenon. A return to Kennedy SpaceCenter by January would put NASA in position to launch in May. Published under license from FLORIDATODAY. Copyright ? 2005 FLORIDA TODAY. No portion of thismaterial may be reproduced in any way without the written consent of FLORIDA TODAY.